Fishes, especially the smaller ones, swim pretty fast and it’s not easy to devour all of them. You may have to go deeper to find fish and this may decrease your shark’s life meter faster. When you can’t find fish and are running out of life, quickly swim up the sea surface to devour humans and birds. Eating them will fill your life meter faster. You can then move down to eat fish. Keep the Boost button to your left pressed when devouring humans and birds so that they can’t escape your shark’s jaws. You should save some coins for upgrading Boost. Beware of eating poisonous marine animals as it can decrease your shark’s life meter faster. Also don’t go too deep. If the shark can’t find any prey, he can go belly-up by the time you move him up the surface. Before pressing the play button, tap on each mission at the bottom of the screen to know more about them. 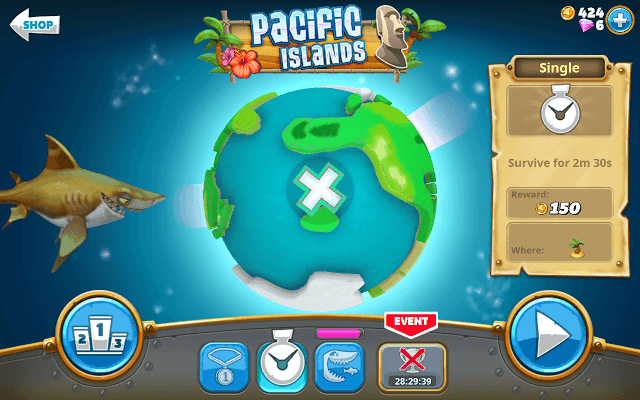 Missions range from eating a certain number of fish and other aquatic creatures to reaching a score target. Some missions are marked as “Single” whereas others are ”Multi” missions. Single missions are those missions that need to be completed in one play session. If you cannot complete a single mission, then it will reset and you have to start from scratch. On the other hand, multi missions can be completed in several sessions and they won’t reset when you start anew game. There will be a pink bar above a multi mission, showing your progress so far. Focus on Single missions first, because you can complete multi missions at your own pace and comfort level and there’s no hurry in completing the latter. You can check your mission progress anytime while playing. Just tap the pause button at the top-right corner of the screen the mission status box will be displayed on the screen. Once you have accumulated enough coins, spend them to upgrade your shark. There are three types of shark attributes – Speed, Bite and Boost. Upgrading your shark’s Speed will make him swim faster. Upgrading Bite will make him chomp on food faster. When you press the boost button on your left, it super charges your shark for a few seconds, making him faster than before. 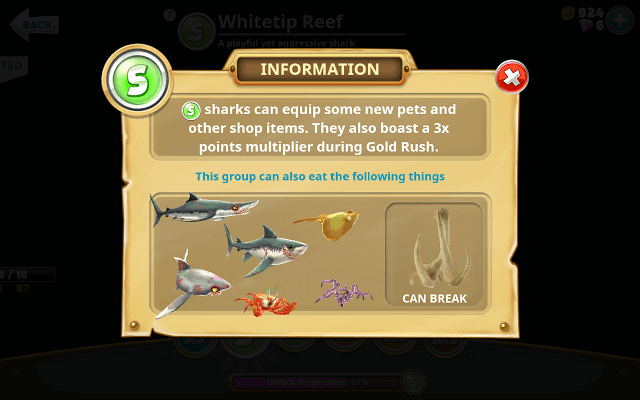 Leveling up Boost will help you boost your shark’s abilities for a longer period of time. Try to spend most of your coins on Speed and Bite, because increasing these two attributes will help you survive longer. Your shark will be able to move and attack faster, devouring prey at a faster rate. Max out these two attributes first using the coins you have earned from every play session. Shark Types are denoted by letters. There are 6 different types of sharks – xS, S, M, L, xL an xxL, with xS being the most common type and xxL is the rarest of them all. As you unlock more shark types, you will be able to use them to devour larger prey, even sea predators and poisonous marine animals. The shark meter appears on the “Results” screen when the game ends. Fill the meter to unlock a new shark type. 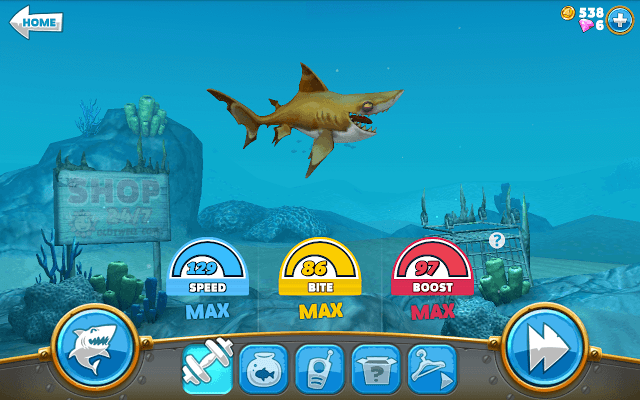 Survive the sea longer in every play session and level up to fill the shark meter faster. 1. Sharks belonging to the xS type can devour smaller prey like fishes and small tortoises, but cannot eat poisonous marine creatures. 3. M Sharks can break sand obstacles and eat the prey. 4. 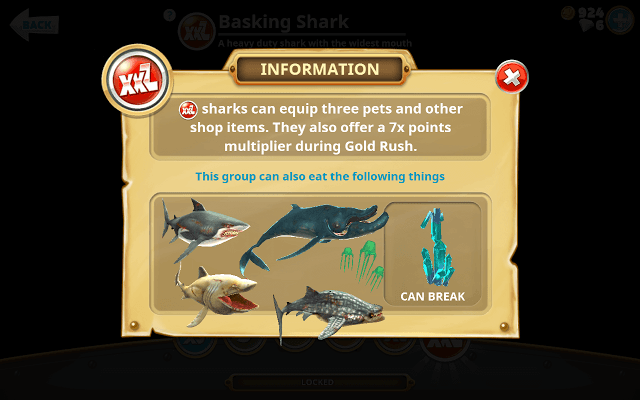 L Sharks can devour larger preys and can be equipped with two pets. Can break metal objects. 5. xL Sharks are huge and can be equipped with the laser gadget. Can eat large preys. Upgrading the map will help you find daily chests, letters and collectible items. Map upgrades cost lots of coins, so make sure you have accumulated plenty of gold coins before upgrading it. Tap the box icon on the shark stats screen to access map upgrades. Keep devouring birds, fishes and humans to earn points. Doing this will also trigger a gold rush. The rush meter can be seen at the bottom of the screen. Fill the meter to trigger gold rush and earn extra gold for a few seconds. 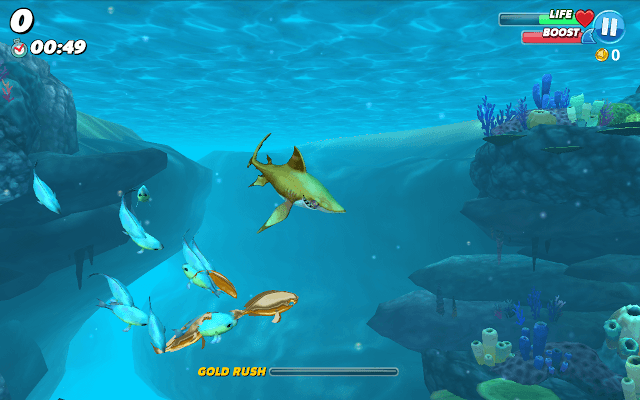 The faster your shark moves and eats his prey, the quicker the gold rush meter will fill. Eating prey quickly in a row triggers higher point multipliers and fills the gold rush meter faster. Sharks can be equipped with pets. Doing this will help you complete missions faster as your pets will also contribute to a mission. You will have to complete certain tasks to unlock a shark type. For example: Dave can be unlocked when you have unlocked an “S” shark type. Felix can be unlocked by achieving a high score of 80000. Look for golden birds, humans and fishes. Eating them will give you extra gold. Purchasing items like Saucepan, umbrella etc. grants food bonus, survival bonus, growth bonus and gold rush. Tap the hanger icon to get access to different types of items. Besides earning coins for completing a mission, you will get survival bonus coins for every minute survived. You will be notified about the bonus while playing. For example, if you have survived for a minute, you will receive a survival bonus reward. If you have survived for 5 minutes, you will receive more gold coins.